Parking $5. Food Concession Available. No outside food allowed. 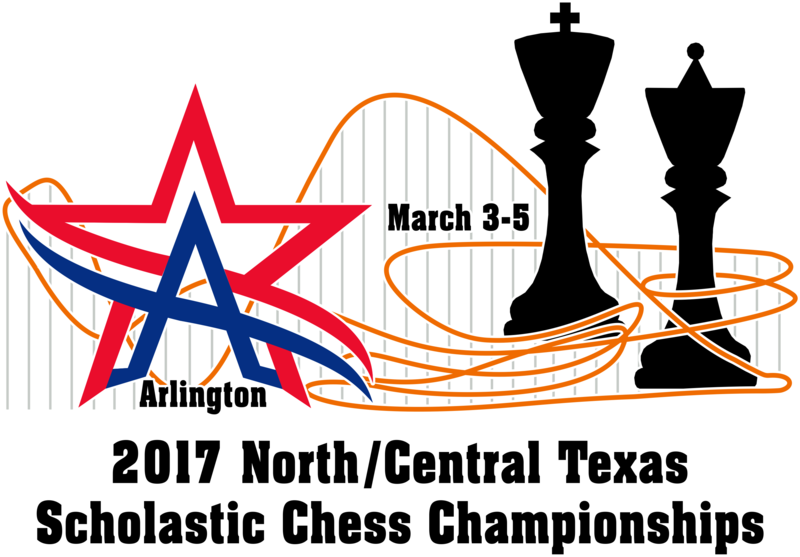 will be hosting a booth at the 2017 North/Central Texas Scholastic Chess Championships. ChessKid is the scholastic extension of Chess.com and is the number one website for kids, coaches and clubs. The site is 100 percent safe and offers hundreds of videos, thousands of puzzles, live chess, and numerous club management features. Come by the booth for free game analysis, prizes for kids, and free trials for coaches. Also, any parent getting a gold membership for a child gets a free ChessKid t-shirt! Some rules and hints about which section to play. 6th grade players in Elementary Schools must play in Elementary sections. 6th grade players in Middle School Schools must play in Middle School sections. 9th grade players in High School Schools must play in High School sections. 6th grade players that are home schooled must play in Middle School. No exceptions have been given. 9th grade players that are home schooled must play in High School. Again, no exceptions have been given. An exception for private school 9th graders that are in a k-9 school has not yet been rendered by the Texas Chess Association; therefore, these 9th graders must play in the High School Section. The TCA Scholastic Committee, (Victor Flores is the Chairperson,) can make an exception for very rare cases not covered by earlier rulings. Most cases have been discussed and ruled upon already. Some of these are confusing. Just what is the Texas Chess Association trying to do? They have two goals. The first is that kids play in their sections. TCA wants the High School winner to be in High School, The Middle School winner be in Middle School, etc. etc. The second is that TCA realizes that it would be unfair in general to isolate a grade. For example, it would be unfair to a k-6 school to have the k-5 kids in elementary and the 6th graders in middle school. The k-5 kids could think that their best players are removed from their team, and the 6th grade players could feel that they have no chance to win in the middle school section. The primary section was created after the rules were passed. So any player in grades k-3 can play in the primary or can play in the elementary. So a k-4 school may choose to play all their kids in one of the elementary sections. Note that a 3rd grader that is rated between 600 and 699 may choose to play in the Elementary J V (U800 section) as opposed to playing in the Primary Championship. In general new players in elementary and middle school should play in the novice section, provided that they have not gotten too high a rating if they have played in one or two tournaments. Another consideration is that players sometimes play in championships sections so that the school has enough players to form a team. The TCA Scholastic Committee is the next higher body in authority. Schools like Texas Academy of Math Science at UNT, The University of Texas at Brownsville and Texas Southmost College Mathematics and Science Academy have been defined by the Texas Chess Associations to be High Schools and may not play in the Collegiate. This tournament will use the February Supplement. Tournament is open to any K-12 living in Texas or going to school in Texas. Note that players may play in either the South or the North Central Championships or they may also play in both. Four championships: TX North/Central Primary Scholastic Championships; TX North/Central Elementary Scholastic Championships; TX North/Central Middle School Scholastic Championships; TX North/Central High School Scholastic Championships. Note that the High School will be played at the Sheraton Arlington Hotel while the Primary/Elementary/Middle School will be played at the Arlington Convention Center. EF: $43 by 2/1; $72 after 2/1 or on site. On Site Registration: Friday, 5:30-6:15pm, Saturday, 8-8:30am. Saturday registrants will receive a 1st Rd. 1/2-pt. bye. Two 1/2-pt. bye allowed as long as one of the byes is for round 1, if requested by the end of Rd. 2. Sections: K-1 Championship, Primary (K-3) Championship, Primary JV (K-3 w/Ratings Under 600), Elementary (K-5/6) Championship, Elementary JV (K-5/6 Under 800), Elementary Novice (K-5/6 Under 500), Middle School (6-8/9) Championship, MS JV (6-8/9 Under 900), MS Novice (6-8/9 Under 600), High School (9-12) Championship, HS JV (9-12 Under 1000). See Article IX, Section 1E, TCA Bylaws for each section's eligibility requirement, www.texaschess.org/2007/03/bylaws.html. Note that 2017 February Supplement will be used. Trophies for top 15 individuals and top 10 teams in each section plus participation medals for all, and plus Score Awards for players scoring 4 or more points that do not win an individual trophy. Top 5 Grand Champion trophies. The 3 Primary sections will be merged and using the top 15 players, a grand champion will be crowned. This will also be done for the 3 Elementary sections and the 3 Middle School Sections. For the High School the two sections will be merged and the top 10 players will be used to determine the grand champions. Note that trophies will not be given out in advance and must be picked up at awards ceremony. Please make arrangements for picking up trophies at award ceremony or to get trophy shipped. Schedule: Round times vary depending on the Section. For round times check website. Time controls: All High School Sections: Rds 1 G/45 d5; Rounds 2-4 G/60; d5, Rds 5-7 G/75; d5. All Middle School and Elementary and Primary and K-1 sections: rds 1-4 G/45; d5, rds 5-7 G/60; d5. For round times see: www.dallaschess.com. Side Events: See website for side events. Side event registration on site only. All registrations (except Side events) available on line: see www.dallaschess.com and you can download flyers and entry forms. Checks payable to Dallas Chess Club. Mail entries to Dallas Chess Club, c/o Barbara Swafford, 2709 Longhorn Trail, Crowley, TX 76036. For tournament info, visit our website or contact Barbara Swafford, info@dallaschess.com or 214-632-9000. Refunds will be given only up to 3/1 with a $10 surcharge for withdrawing, after 3/1 there will be no refunds. There will be no substitution of team members. There will be a $10 change fee for changes after 3/1. There will be a $5 surcharge per player for phone registrations USCF membership is required. Proof of membership is required or player must join/renew their memberships. No registration/changes/or withdrawals by phone or email after 3/1/17 as we are driving to the site; after that date you must make changes at site (Arlington Convention Center). Note that the Arlington Convention Center has a strict policy of no outside food and beverages allowed. They also have a 10 pm curfew. NS, NC, W.